MOSS 007 - TRANSNEPTUNIAN "Infinite Expansion"
A travel through the endless cosmos and space. An EP with two tracks of Atmospheric Black Metal. 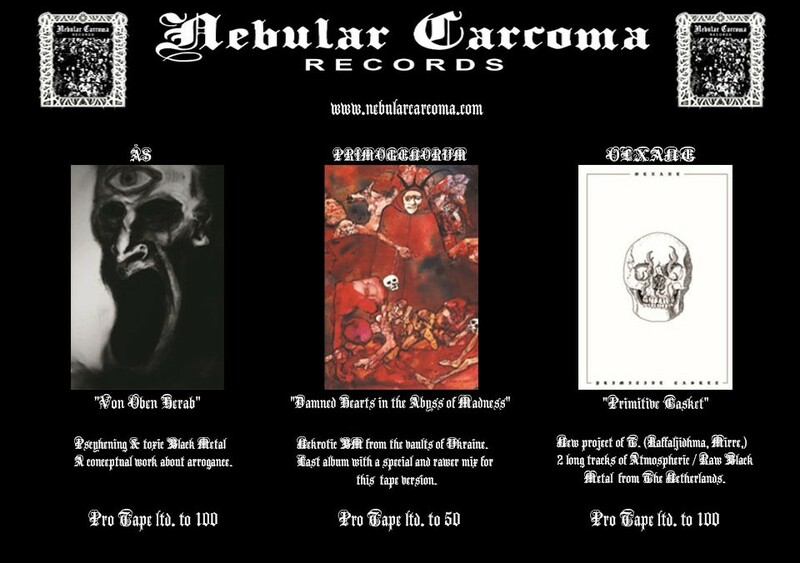 MOSS 009 - EMPTY "The Last Breath of My Mortal Despair"
Nebular Carcoma, in conspiracy with Negra Nit, presents finally on vinyl: "The Last Breath of My Mortal Despair". This second album introduced EMPTY to a darkest, negative and lugubre sound. 7 tracks of irremediable anguish, of hate to life. A journey to a place of black sentiments and spiritual catharsis. LP limited to 250 copies. 13€ + shipping. MOSS 015 - HIKAN "A Breath of Sorrow for a Dying Spirit"
[i]Second album of this unknown and mysterious entity "A Breath of Sorrow for a Dying Spirit" consists of six tracks of blazing Black metal filled with an aura of desolation and raging melancholy. Includes as bonus the first album "The Cycle of Pain". Pro Tape limited to 66 copies. 4'5 € + shipping. MOSS 016 - BROKEN SPIRIT "Vivid Dreaming"
"Vivid Dreaming" open the gates of isolation and void to converge on altered states of anxiety, grief and mental chaos. MOSS 007 - TRANSNEPTUNIAN "Infinite Expansion" Pro Tape LAST COPIES! 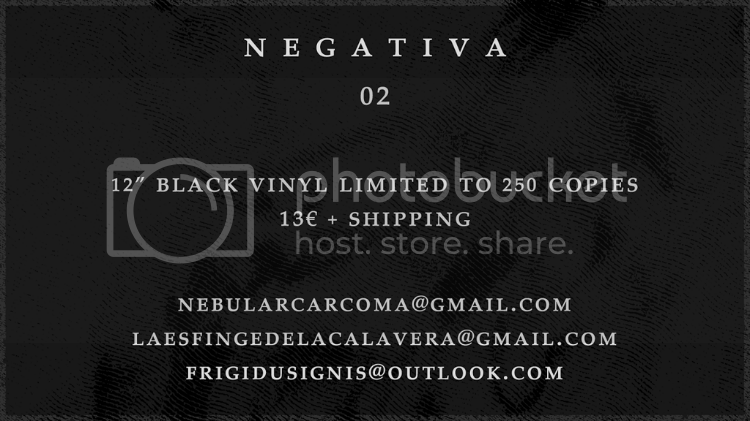 MOSS 013 - NEGATIVA "02"
with its characteristic introspective sound crafted during the last years. 12"LP limited to 250 copies. Released in conspiracy with Esfinge de la Calavera & Frigidus Ignis. 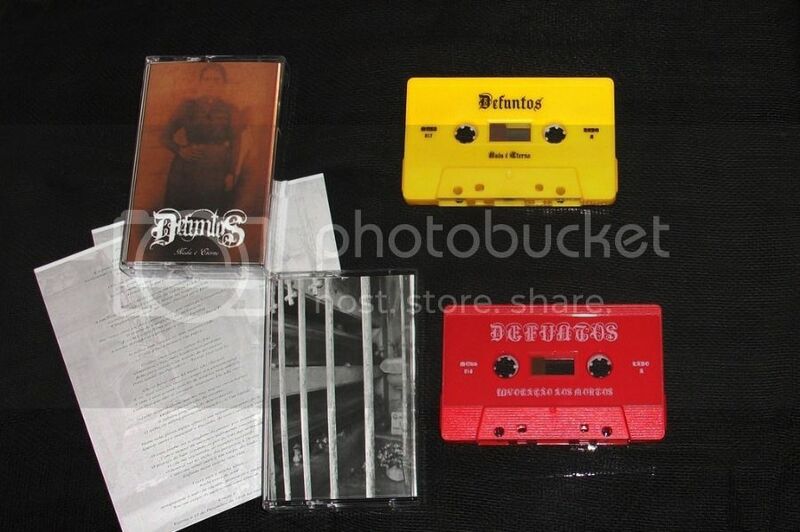 MOSS 017 - DEFUNTOS "Nada é Eterno"
MOSS 018 - DEFUNTOS "Invocaçâo Aos Mortos"
Available again these two releases of Portuguese Black/Doom masters DEFUNTOS, this time as professional tapes. 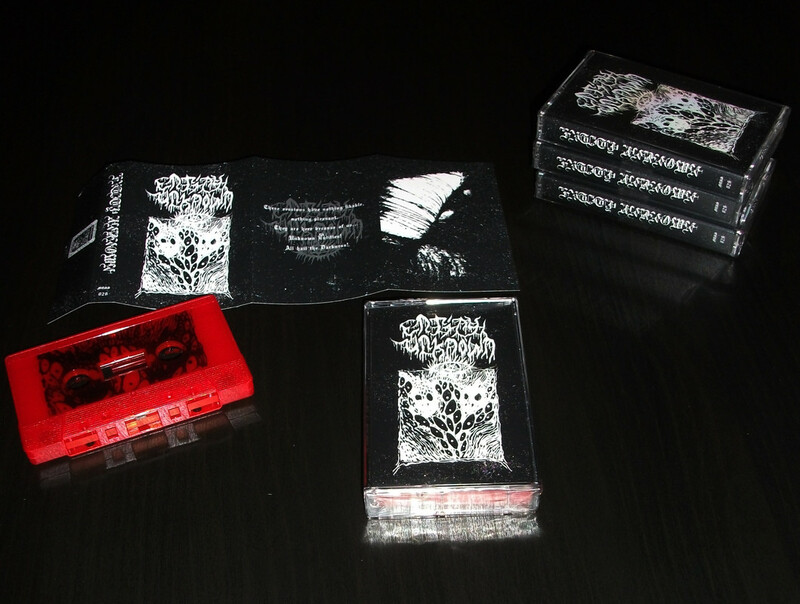 Pro Cassettes limited to 100 copies. 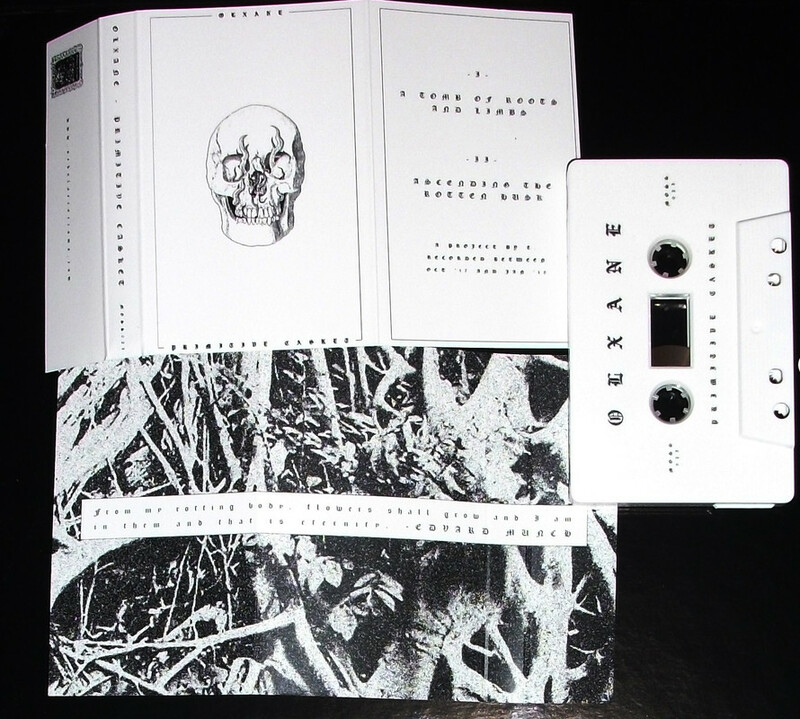 FACELESS ENTITY LP & PRECARIA tape OUT NOW! MOSS 012 - FACELESS ENTITY "In Via Ad Nusquam"
Emerging from the deepest of voids, Faceless Entity reveals its first album "In Via Ad Nusquam". Death and duel is what you'll find in these 4 tracks (+ intro & outro) from one of the best current Raw Black Metal acts, hailing from the prominent Dutch scene. 12" LP limited to 200 copies. Released in conspiracy with Altare Productions. MOSS 019 - PRECARIA "Precaria"
The enigmatic first material of Precaria. 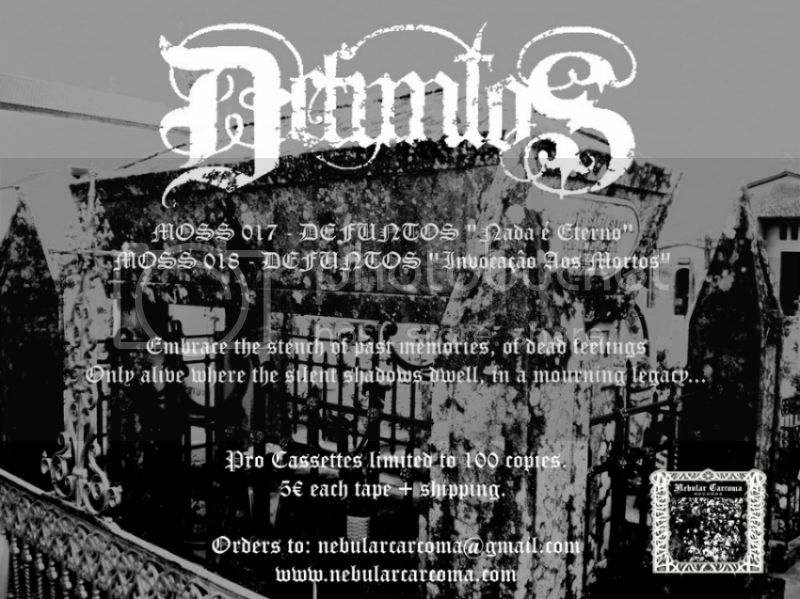 4 tracks of envenomed guitars, relentless drumming and anti-cosmic incantations. Unveil this gem hidden in the dark if you dare to explore the utter depths of consciousness. 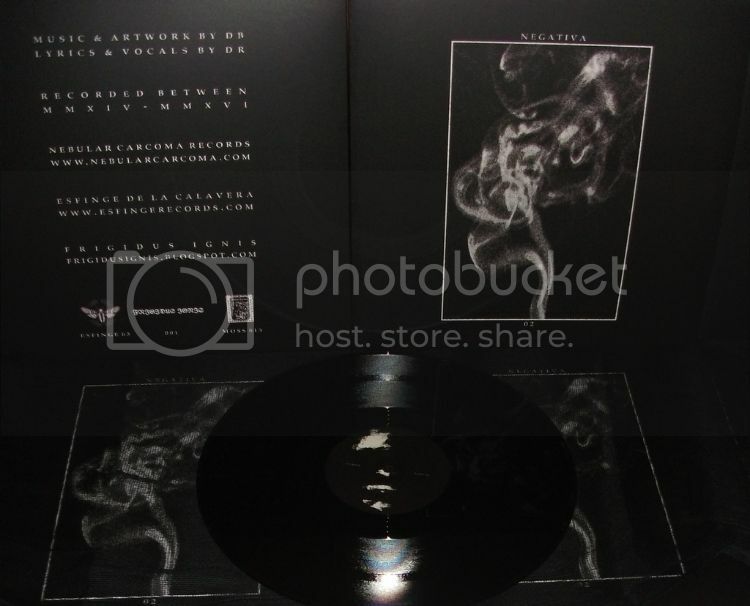 CANDELABRUM "The Gathering" CS out now! 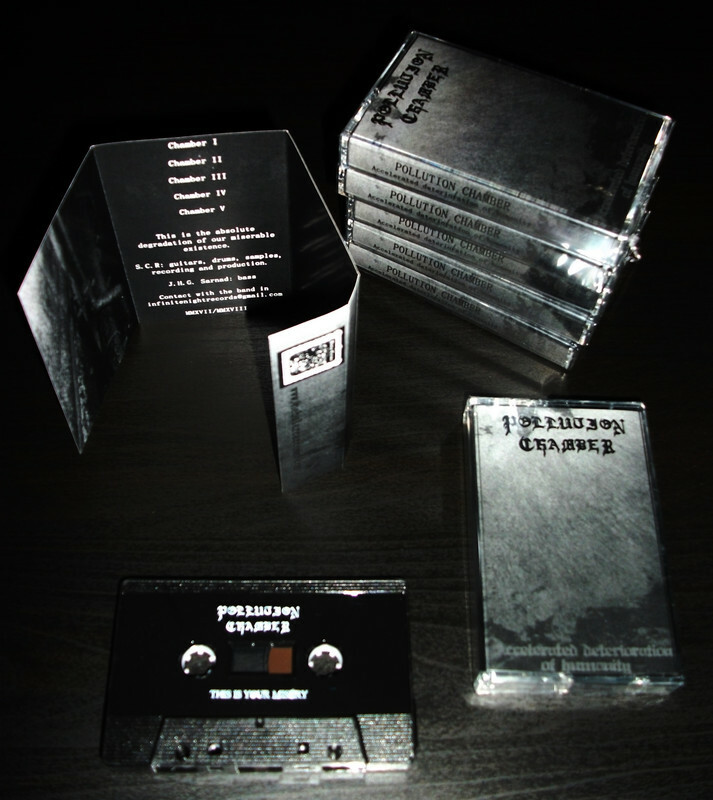 Cassette edition of "The Gathering", that compiles the three CANDELABRUM demo tapes. Expect raw majestic Black Metal, channeled from otherworldy entities. 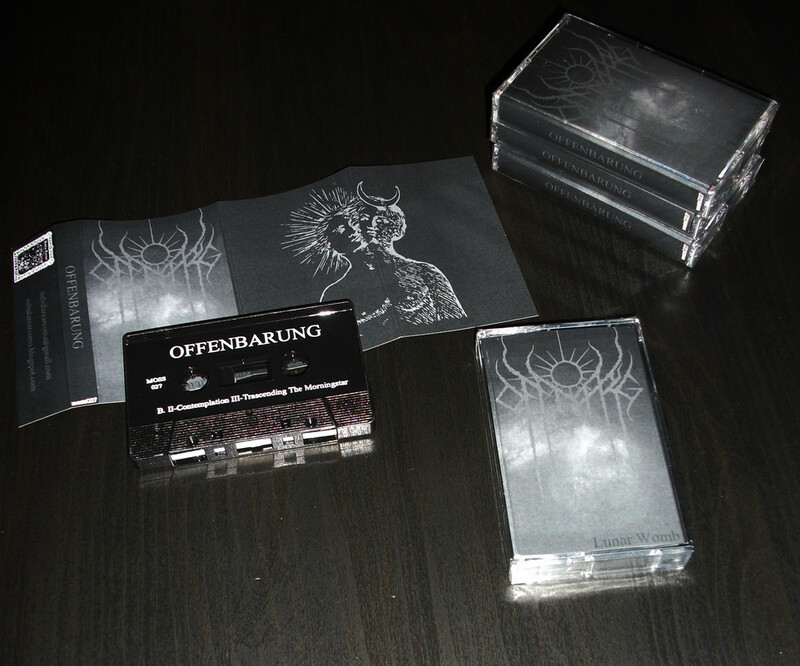 ÅS / PRIMOGENORUM / OLXANE cassettes out now! 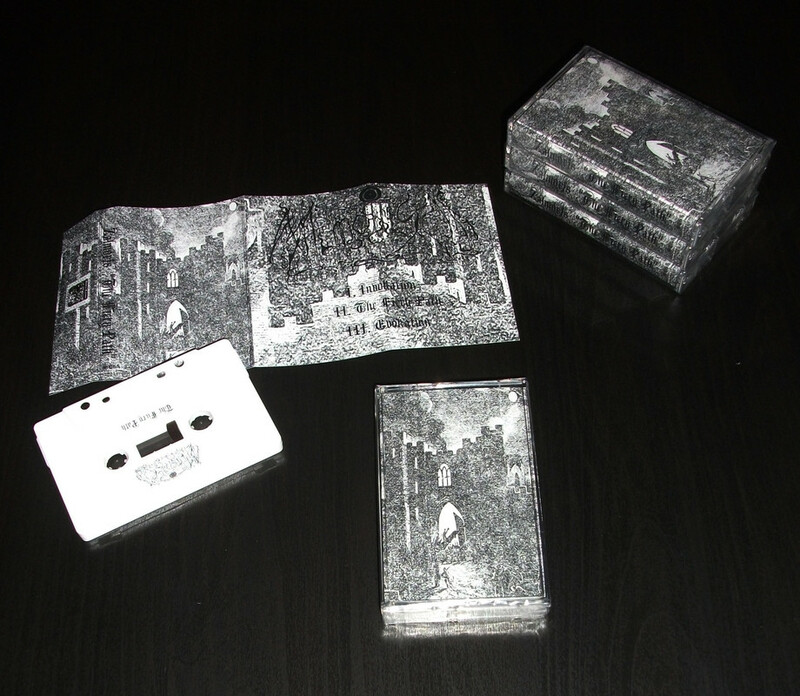 Debut demo from this German band of psychening & toxik Black Metal. A conceptual work about arrogance where the 4 tracks included reviews different aspects of said phenonemon. Pro Tape limited to 100 copies. 5€ + shipping. Nekrotic Black Metal from the vaults of Ukraine. Last album with a special and rawer mix for this cassette version. Pro Tape limited to 50 copies. 5€ + shipping. New project of T. (Kaffaljidhma, Mirre) 2 long tracks of Atmospheric/Raw Black Metal from The Netherlands. 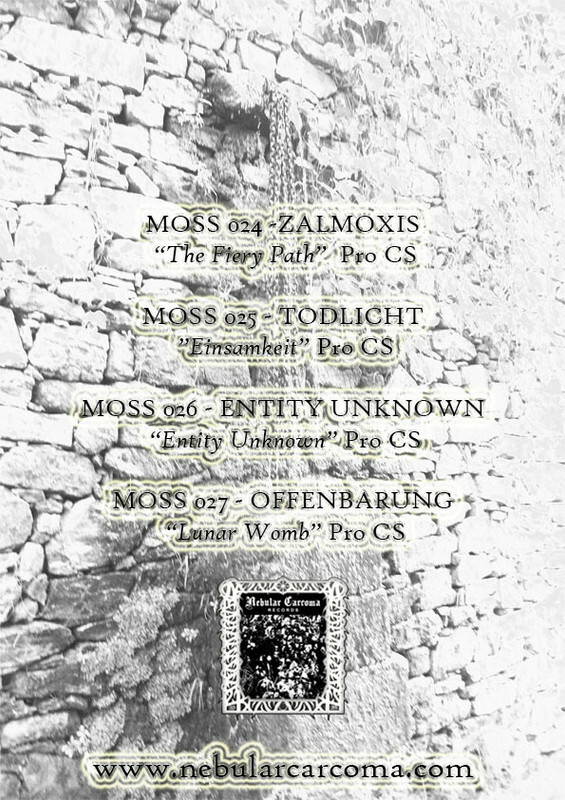 ZALMOXIS / TODLICHT / ENTITY UNKNOWN / OFFENBARUNG out now! 2nd demo from this project featuring the main man of Ås and Fortress of the Olden Days. Grim and eerie Black Metal with a haunting and scary atmosphere. Pro Tape. 5€ + shipping. Hopeless and cold Black Metal. First release of winter-driven soundscapes by this Bosnian entity. From Bosnia-Herzegovina, unpleasant raw Black Metal in the name of darkness. First demo of ambient and dissociative Black Metal. Contemplation, reflection, destruction and generation in a place and a time out of this world. New Raw Black Metal project featuring members of Black Spirit, Bulturnos or Cryptic Wanderings among others. This is the absolute degradation of our miserable existence. 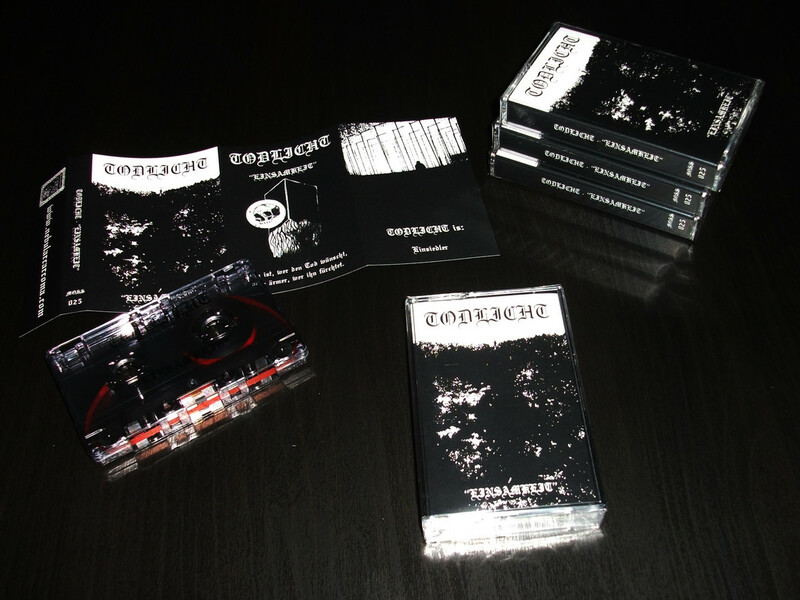 Pro Tape ltd. to 50 copies. 6€ + shipping. Raw and cruel Black Metal not suitable for weak souls. Pro Tape ltd to 50 copies. 6€ + shipping. 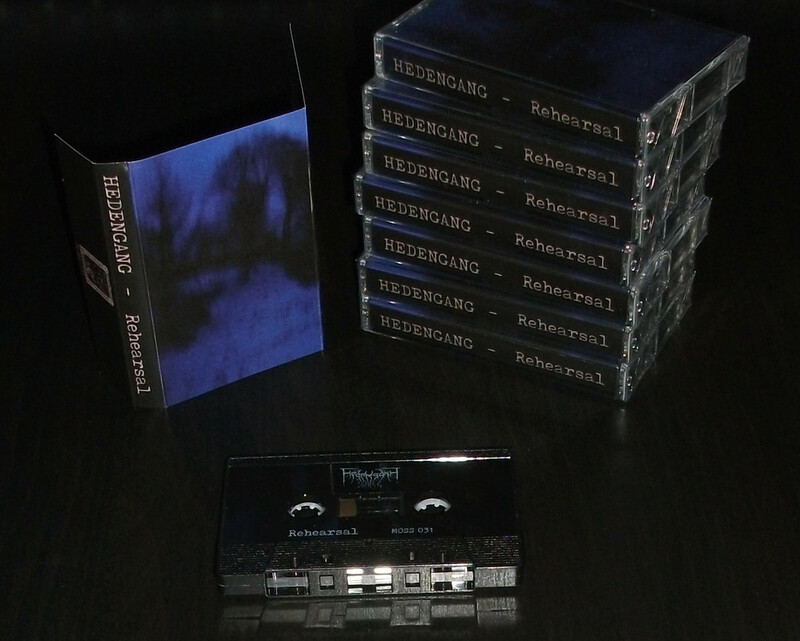 AIWIGAZ UNÐERGANGAZ and HEDENGANG tapes out now! 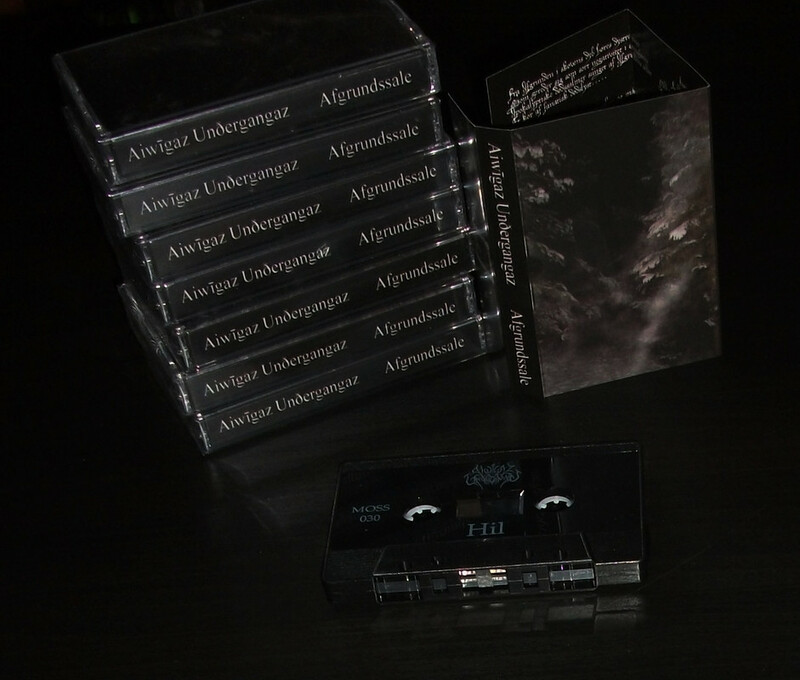 Obscure and raw Black Metal from the Afsgrundsvisioner collective. Rehearsal finally available after the release of the first full-lenght. Pro Tape limited to an undisclosed number of copies. Hypnotic and enchanting Black Metal hailing from Danish soil. One long and evolving track that will haunt you down to reach a total state of hypnosis.